I have recently done my second ride with the artists formerly known as Motor Biking Vietnam. Some things were different; the company name, guide, places, people and weather all varied from one ride to the next. And some things remained the same; the mighty Minsk, the feeling of escape adventure, great company, great scenery…. and the guide's stories (which possibly indicates they could even be true). I cannot recommend highly enough a trip through the back roads of Vietnam with these guys. The first ride, with the guide and three other riders, took us around the hinterland of Hanoi. The roads were well chosen and offered different pleasures and challenges. Sometimes we were cruising along well made roads, for example around a reservoir. And at other times we were slipping and sliding along muddied roads. And at the challenging end of the spectrum, we were occasionally pushing our bikes through muddy roads – if ‘road’ is still the right word. It was great fun – even through the cold (gore-tex boots, two pairs of socks and two plastic bags refused to keep my feet dry and warm). The boat trip up the river with the bikes was a great break, and I recommend making such a trip a part of any itinerary. But, what I especially enjoyed was the home stays – seeing how other people lived and enjoying their hospitality. We had two home stays out of four nights, and each was wonderful. In fact, the whole ride sometimes seemed like we were on one big visiting trip around North Vietnam; every town had a mechanic we had to drop by and say hello to, there were a couple of visits to schools and some various other friends of the guide. To me though, this made the trip. Seeing so many people. 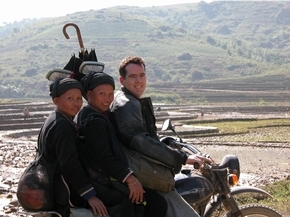 The second trip, up the road to China, was also really enjoyable. This time, the weather was perfect. I was just with another guide and my brother. The ride took longer to reward. The first day and a half out of Hanoi is, to be honest, a bit bland. But then, it just opened up. The scenery was really beautiful, and occasional trips off the road to explore were well worthwhile. Watching our guide just invite us into someone’s house (someone he had never met before in his life) was great. As well as the ride getting better the further north we ventured, the accommodation improved. As much as I can handle your more average, garden variety, small town Vietnamese hotel (where, for example, the towel is the size of a tissue and a dog comes out to clean up the restaurant at the completion of a meal), I would take the views of the Fansipan mountains from a comfortable hotel balcony any day.